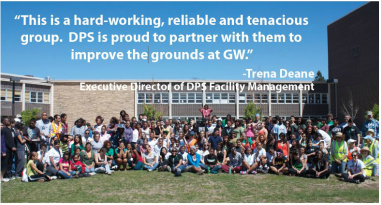 The GW Grounds Committee was formed in 2007 to support the GW community by improvements to the outdoor space of the school. Our committee is composed of diverse members of the school community interested in any and all aspects of horticulture -- from landscaping to fruit production. We are positive, supportive, and open to all; we welcome additional committed volunteers. George Washington High School is one of the largest high school campuses in Colorado and, in 2007, was definitely in need of a landscaping face-lift. 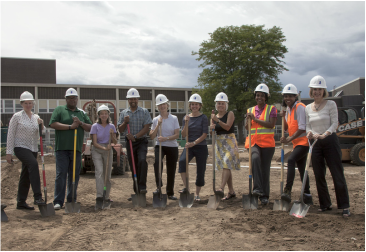 Since then, the Grounds Committee has engaged hundreds of students, teachers, parents and alumni in landscape activities that have significantly improved the appearance of the school - for the benefit of students, teachers, neighbors and the many community groups that use the school. We are proud to have designed and sponsored the Gateway to the main (north) entrance to the school, which was installed in the summer of 2013. We are also proud to lead annual student tree plantings, which have added over 80 trees to the campus. We implemented the student-led plan for the orchard on the Leetsdale side and help the student Grow Club tend that orchard. There is so much more we do and can do with your help. Come to our next activity and have some fun getting your hands dirty!